Our Nursery school aims to meet the educational, intellectual and creative needs of the preschool child. Using a Montessori based philosophy Montessori equipment , educational toys, books , songs and creative materials, the child is encouraged to develop their mind and bodies. We will foster imagination and curiosity through exploration and manipulation to the enhance the growth of each child's self image. As seen in brochure and policy and procedure manual first page. At Fonthill Montessori Preschool we strive to establish positive relationships with the children in our care and the families of those children. As per the Montessori philosophy we will value the child as an individual and each child will be an active contributor to their interests and learning style. The emotional, social and cognitive well - being of each child will be developed in an environment which promotes the child's ideas enabling them to investigate their theories in a warm supportive setting. Support parents and families with information, resources and guidance with child care and transition to school. Comply with all relevant legislation within the Child Care and Early Years Act. Staff growth and development will be encouraged through the availability of resources provided by the ECCDC and other related sources. The basic premise of the Montessori philosophy of education is that all children carry within themselves the person they will become. The Montessori classroom provides the environment and materials that the child needs for his personal development, while allowing him the freedom to choose his activities according to his own periods of interests and readiness in a non-competitive environment. Dr. Montessori believed that every person must educate himself; that a teacher is merely there to provide information and to guide a student through the learning process. She felt, therefore, that the goal of early childhood education should be to cultivate in the child curiosity, a love for knowledge and a strong desire to learn. The Montessori classroom approaches this goal in two ways. First,by allowing each child to experience the excitement of learning by his own choice and at his own pace. Secondly, by helping him to perfect all of his natural tools for learning so that his ability will be at a maximum in future learning situations. The Montessori classroom fulfills both of these long range purposes in addition to the immediate purpose of providing the child with specific information (sounds, mathematics, etc). The young child acquires information naturally by employing all of his senses to explore his surroundings. He literally “absorbs” the information he receives with no effort at all and retains this ability until he is almost 7 years old. Dr. Montessori reasoned that a child’s development could be enriched by an environment where he could freely handle materials which would demonstrate educational information to him. For more than 60 years Montessori classrooms have demonstrated that a young child can learn to read, write and calculate in the same natural way that he learns to walk and talk. In order to learn there must be concentration. A child concentrates best by fixing his attention on a specific, purposeful task he is performing with his hands. All the equipment in the classroom entices the child to explore and learn with the use of his hands. Montessori is a unique method of education designed to take advantage of the child’s sensitive period for learning between the ages of 3-6 when he can absorb information easily from an enriched environment. The habits and skills, which the child develops here are good for a life time. They will help him to work more efficiently, to observe more carefully and to concentrate more effectively throughout his life. The intellectual progress is naturally accompanied by emotional and spiritual growth. The child becomes aware of and learns to love and care for himself and the people and things around him. He learns cooperation and gains inner discipline and independence, which leads to a high sense of self-esteem. The Montessori method offers individual attention to the whole development of the child and the foundation on which the child can build his future success and happiness. Sign up for our Newsletter below to receive our updates to your Inbox! 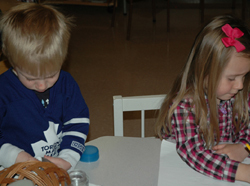 Fonthill Montessori Preschool is registered with the Ministry of Community & Social Services. Your child will be encouraged to follow his interests, learn from intriguing, didactic materials and develop at his own rate in a cooperative, nurturing environment.